Advertise or exhibit with us and you will reach a targeted audience of environmental professionals across our niche websites. Whether as part of a major marketing campaign or a one-off promotion we can expose your brand to our community and direct traffic to your website via an advertising package to suit your needs. Work with us, and you will share our highly targeted web traffic, drawn from the sectors and job roles you want to reach. Choose whether your banner appears on Environment Analyst’s Market Intelligence Service website or Environment Analyst’s Development + Infrastructure Service website. Discounts available to be featured on both. Your banner will appear across our home and news pages, and on our events hub. Ad included in email alerts sent to approx 8,000 subscribers, subject to rotation with other adverts. Be listed in our fortnightly email alert sent to over 8,000 subscribers. Job adverts vary depending on the job package chosen, for more information please visit our jobs advertising page here. 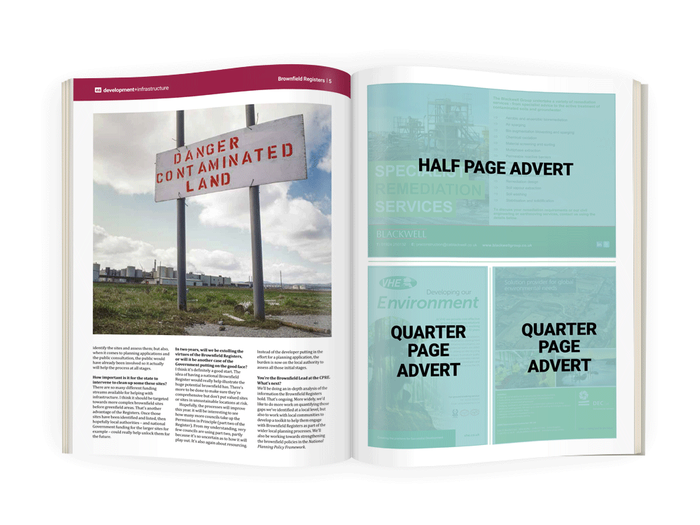 The Development + Infrastructure magazine is a quarterly publication brought to you by Environment Analyst’s Development + Infrastructure Service, and covers a range of environmental issues affecting development, including brownfield land, EIA & planning, flooding, ecology and sustainable building. Each magazines is widely distributed (in PDF format) to 19,000 environmental professionals, including past conference delegates and website registrants. in all four issues of the magazine. Price: £200 + VAT, Valid for 12 months. 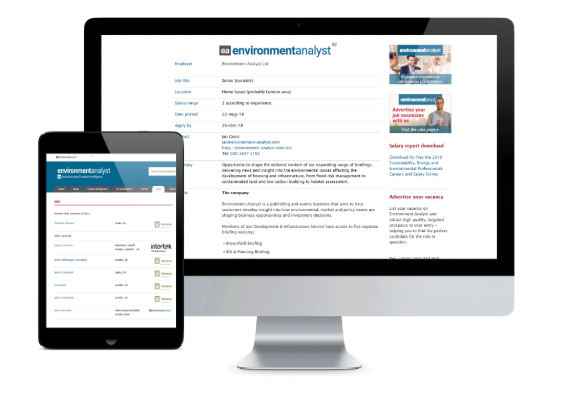 We run an impressive selection of conferences, webinars and industry awards each year across the Environment Analyst Ltd portfolio. For more information on advertising opportunities at our events download our exhibitor and sponsorship pack here. To find out more about advertising with Environment Analyst, call +44 (0)20 3637 2191 or email sales@environment-analyst.com.